The consortium of CGIAR Centers implementing the Feed the Future project Malawi Improved Seed Systems and Technologies received a vote of confidence when a visiting team from the USAID headquarters as well as USAID/Malawi mission expressed their satisfaction after witnessing the work the partners are doing in the field. Dr Rob Bertram (left) listening to a presentation by Dr Alene Arega of IITA on a soy demonstration field. 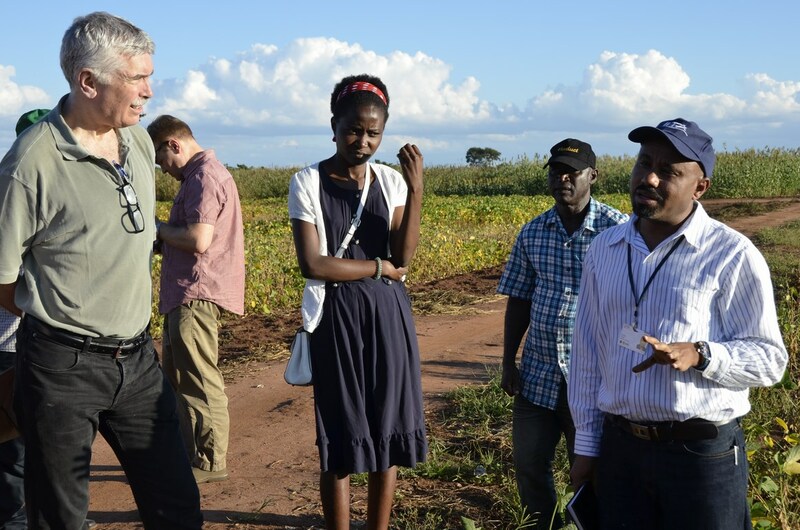 The USAID team, which was led by their Chief Scientist, Dr Robert Bertram, visited IITA’s soybean trials and breeder seed production as well as various other trials and demonstration plots at Chitedze Research Station. The visitors had a chance to listen to presentations and also to appreciate more of the consortium’s work when they visited a pavilion at Chitedze Research Station where members showcased some of their achievements through displays. Speaking later, the USAID team leader was visibly impressed. He described the work of the CGIAR Consortium in Malawi under the project as ‘exciting’. Dr Bertram also added that the consortium was filling a gap in a sustainable way that empowered all the national partners and would benefit farmers and communities due to the increased availability of seeds of improved varieties. The project will use public-private partnerships and revolving fund approaches to develop a sustainable soybean seed production, marketing, and distribution system with complementary integrated crop management practices to enhance the farmers’ access to improved technologies and increase their adoption. 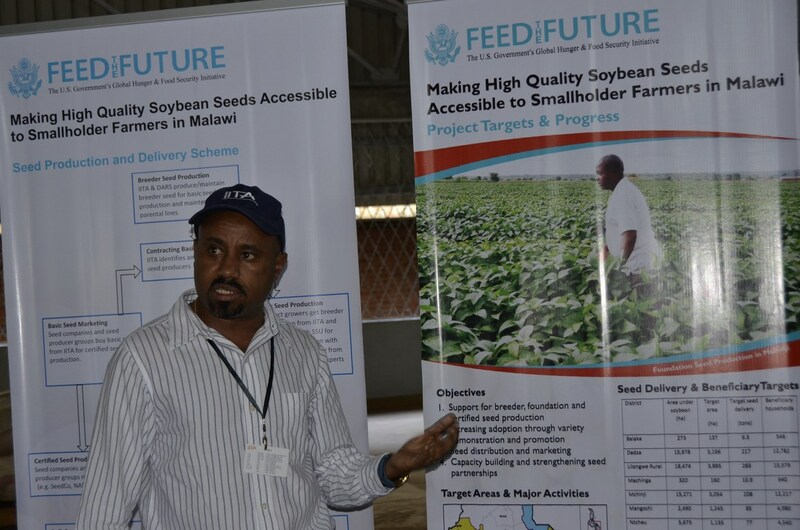 Breeder seeds will be produced by the Department of Agricultural Research Services (DARS) and IITA to support the public, private, and community-based seed producers and will be fed into a network of certified seed producers. These include small-scale seed enterprises and community-based seed outgrower schemes to produce the targeted quantities of certified seeds. “This will help to drive diversification because if people are more confident about their maize yield, they will put some of their land to other crops. I was really excited and would love to see this partnership emerging at the grassroots level in the CGIAR system,” he said. Responding to questions by the visiting team on IITA’s partnership with local organizations, Dr Arega Alene, IITA’s Country Representative, said they were working with the National Smallholder Farmers Association of Malawi (NASFAM), a reputable organization with vast experience in community-based seed production. “So far, the relationship has been good as we have managed to implement the project according to agreed plans,” he explained. Dr Arega explaining about the project during a visit by the USAID team to IITA’s display booth.